Just got done reading this huge book Chunklet presents The Overrated Book. Took me a while. It says this book weighs two pounds! It’s about 205 pages. This book is hilarious and not only would hipsters like this, but also rockers, punks, emos, as well as film geeks. Pretty much all music fans. I’m not sure how I found out about this book, and I’ve never heard of the magazine, Chunklet, out of Athens, Georgia until I found this book. From what I understand, this is a collection of stories that have appeared in the magazine in the past. So it’s all new to me… And I plan on reading their other books as well. 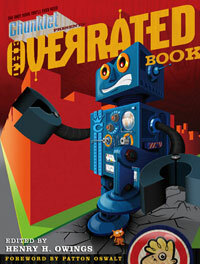 The editor over at Chunklet is Henry H. Owings, and this book has a forward by Patton Oswalt. The audio in the 3rd video is messed up, but you still get the idea. This entry was posted in Hip Books, Hip Internet stuff, Reviews and tagged Boy Scouts, Chunklet, Hip books, hipster approved, Overrated Book, Record covers, SXSW Fest by HipsterApproved.net. Bookmark the permalink.